We’ve just finished our first 24 hours in Bangkok and I think it’s safe to say that we’ve packed a lot in. Yesterday we were way too tired to do much of anything, so checking out the Thai massages being offered everywhere on our street seemed like the best idea. We opted for a 120 baht ($4 CAD) 30 minute foot massage at a place called Spaya. It was really clean, friendly, and we got to lay back in comfy lazy boy chairs. The massage was absolutely to die for. They went the whole 30 minutes, ending with a neck and head massage for the last five. It was the perfect way to shake off all the traveling we did the two days previous. After that, we headed home and took a 10 hour “nap” followed by a marathon of Suits before going back to bed. Jet lag really got the better of us. When we woke up, we headed down to the Thai Travel Clinic since I needed to grab one of the vaccines I couldn’t get at home. I’ll write more about how you can save money getting vaccinated in Thailand later in a full blog post. The walk was an hour away, so we left nice and early so we could take our time and enjoy the sights. Although we were sweating our faces off, it was nice to stumble upon so many temples and it was cool to be able to dip into all the side markets and check out all of the street food. We dipped down one small street that reaked of fish to check out the stalls and sure enough, there was live catfish and eels flopping around in buckets while their friends were getting their heads cut off. Chicken legs laid plucked on ice and cauldrons of soup bubbled as we walked by. Stray cats were staring at us hoping for food as we left. Sorry kitties! 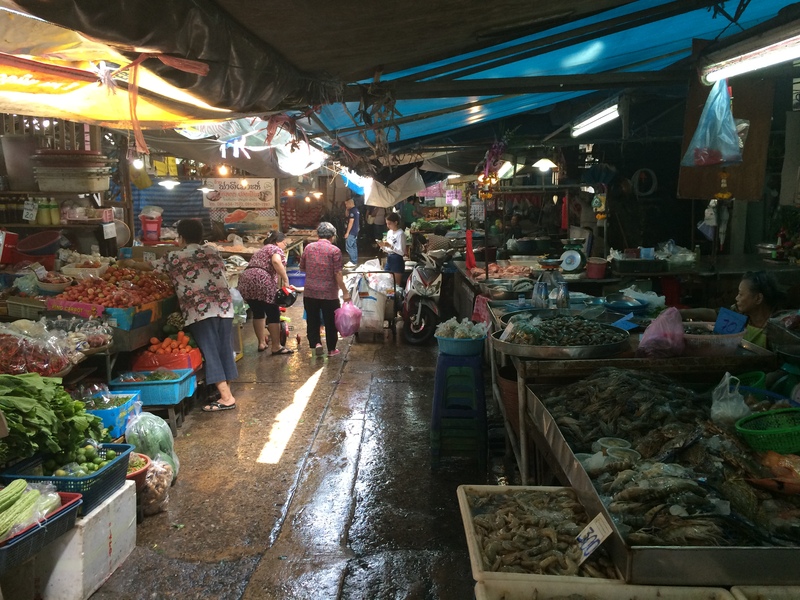 Bangkok as a whole sort of has this fishy, spicy aroma to it. They’re worn down and a lot of the shops are closed. The sidewalks aren’t very busy, but I have to say that crossing the street is probably the most dangerous thing we’ll do here in Thailand. Drivers are insane! On the way, we bumped into Dusit Zoo and decided on a whim to go in and see the giraffes, big cats, and monkeys. For 150 baht ($5 CAD), it was well worth it. The park is nicely laid out, but small enough so you’re not backtracking too much. They had manmade tree-top walkways that allowed you to see most of the exhibits from above. The reptile and nocturnal animal exhibit is air conditioned too, so we were able to grab two nice cold breaks from the hot and humid day. You could feed the hippos if you want — they’re hilarious to watch. Once we got home, Luke decided that he really wanted to catch a Muay Thai match. He found that the Rajadamnern Stadium held matches on Wednesdays so we walked over. 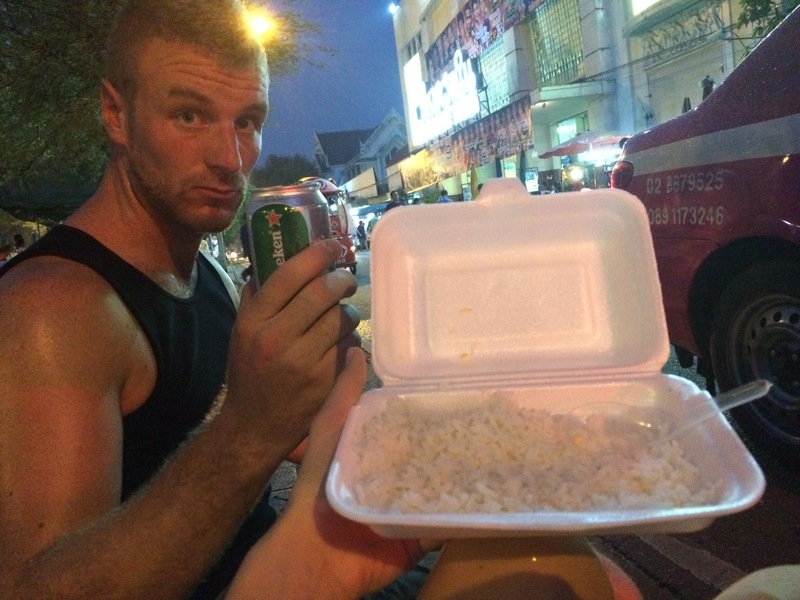 Stopping to grab some rice and eggs off a street vendor before heading in, it was officially our first attempt at buying something off of the street. I promise, we’re working up to being more adventurous. But, for now, an egg and rice was all I could handle. 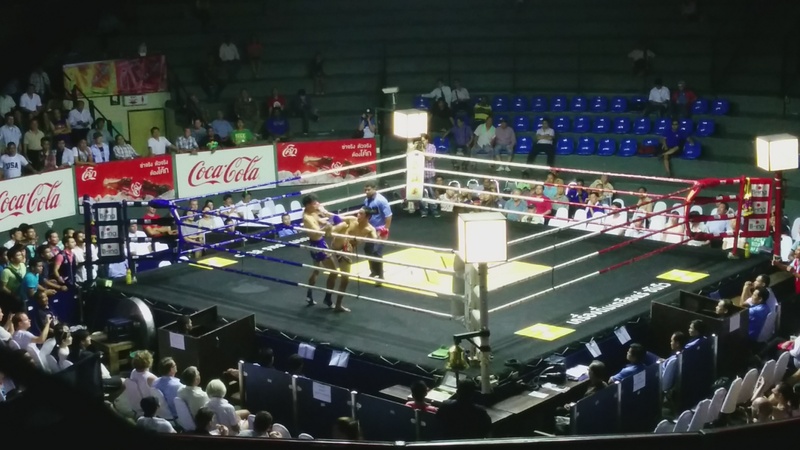 Luke had read a ton online about how the Muay Thai stadium gets Westerners to pay anywhere from 1000 baht ($34 CAD) – 2000 baht ($68 CAD) each night while locals only pay around 250-700 baht. He had his heart set on getting our tickets for the local price, but we read all over the internet reviews that it’s next to impossible to get local price since they simply won’t sell cheap tickets to white people. He tried to ask locals how much they were paying, but the crowd wasn’t really the chatty type. After 15 minutes, we called it in and grabbed the 1000 baht stadium seats. Luke: 0 – Muay Thai: 1. Here’s a tip if you’re thinking about catching Muay Thai: The “guides” at the front who speak English will tell you that the 2000 baht floor side seats are the best way to go. You can sit! There’s popcorn! Who wouldn’t want that? Well, it looked pretty lame to us. The floorside seats were all white, Western people who looked incredibly out of place (to put it gently). You can sit in the stadium seats for half the price (the guides tell you it’s standing only — which isn’t true). In the 1000 baht seats, you’re sitting with all the Thai fans who are yelling, betting, standing, chanting, and cheering. There’s tons of space and everyone is smiling and friendly. Our view from third stadium level at Rajadamnern Stadium Muay Thai.